I-flex Review – Is This Product Safe To Use? I-flex is a product that is manufactured by the Dutch company DSM. It is primarily to be used by those suffering from joint pain, whether due to aging, past injuries or health conditions such as arthritis, tendonitis etc. These types of products are more popular than ever now, given that the ‘baby boomer’ generation are entering their senior years, but still want to stay as active as they have always been. It is an over-the-counter treatment that offers them an alternative to the standard Glucosamine/ Chondroitin remedy which are substances that may not be suitable for all users. There is a very good amount of information about the I-flex brand, found on DSM’s official website. There are details regarding the company’s background and how the this formula was discovered, plus an FAQ section and comparison charts that explain how I-flex differs from other joint pain treatments. 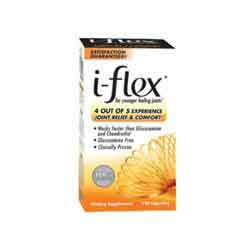 The benefits of the I-flex formula is backed up by scientific studies which are provided on the website. The The capsule consists of one ingredient which is Rosa Canina, otherwise known as Rosehip. Dried and made into a powder, the Rosehip has shown to have a positive effect on the joint by reducing the amount of damaging Chemokines in the body. It is also a powerful anti-oxidant which helps boost the immune system and adds to general overall health. Rosehip is included in the I-flex capsule at an amount of 45g which, while high, is proven to have no harmful side effects. Additionally, because the product does not contain Chondroitin, it is suitable for those with seafood allergies and vegetarians. I-flex appears to be a beneficial product that has a positive effect on joints. Many North American consumers who are more used to the Glucosamine and Chondroitin formulas may be try something that relies solely on the power of Rosehip, but they can at least see from clinical studies that it does produce good results.